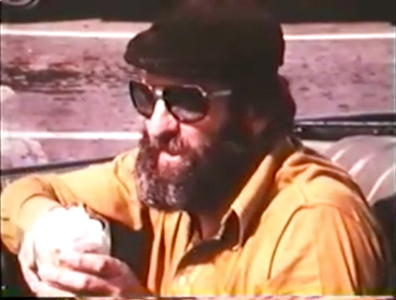 The first time I watched the 1972 documentary “Reyner Banham Loves Los Angeles” I was too distracted by the “Baede-Kar,” a dash-mounted radio tour guide system with a voice only slightly less creepy than HAL 9000, to pay much attention to frozen confections. But watching it again this morning (yes, it was research), I was delighted to discover that ice cream makes an appearance late in the film. Banham is pondering what sort of Los Angeles buildings would best represent the city to tourists. Lamenting that L.A.’s best architecture is private and that its public buildings are generally bad, he decides to enlist the help of two local experts: Ed Ruscha and Mike Salisbury. When Banham reveals that he has invited them to a meeting at Tiny Naylor’s Drive-In and that the meeting will take place in a Cadillac Coupe de Ville convertible, you get the idea that he’s already decided what kind of building best represents L.A.
Douglas Honnold designed Tiny Naylor’s Drive-In in 1949, after he had spent a few years in the office of John Lautner. 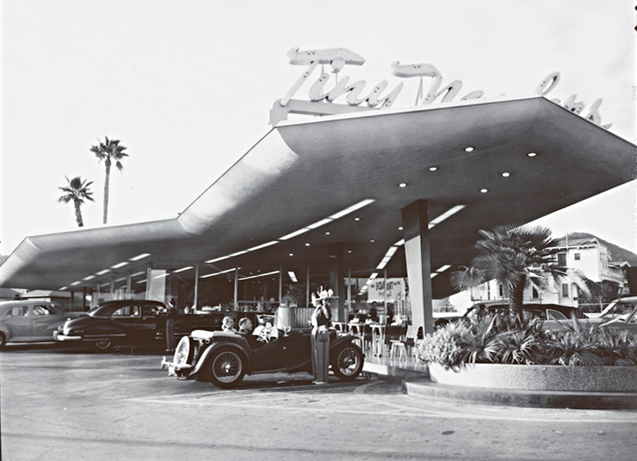 Julius Shulman’s splendid 1952 photograph of the place makes it clear that Honnold had learned a few things about exuberant commercial modernism from the Googie master because that cantilevered canopy is clearly poised for flight. 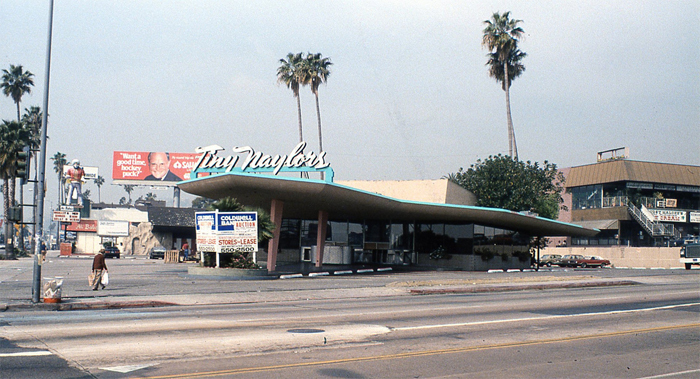 Tiny Naylor’s stood on Sunset Boulevard at La Brea until it was demolished in the 1980s to make way for a box so banal I won’t even post a photo of it. But I digress. As Banham, Ruscha and Salisbury pull in to Tiny Naylor’s they put down the hardtop and have barely come to a stop before the carhop waitress hands them menus. 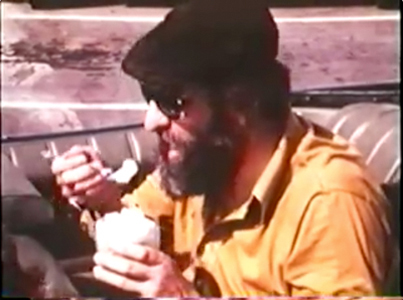 Banham quickly selects a pineapple sundae and tucks into it with gusto once it is served. I’m not sure what kind of ice cream I thought the eminent architectural historian and all-around design guru would be partial to, but I can tell you that this oddity never crossed my mind. When I was scooping ice cream professionally, nobody ever ordered pineapple sundaes and the syrup sat in its vat slowly congealing. But that was the east coast in the 80s; perhaps the west coast in the 70s was different. I will rely on my Angeleno friends to enlighten me on this issue. Postscript: both Ruscha and Salisbury had BLTs.